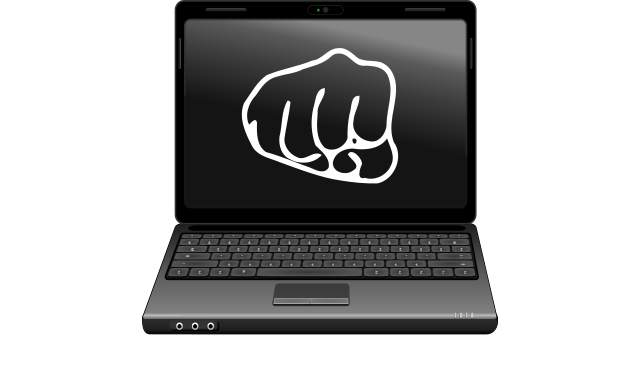 Wouldn't it be good if you could punch people in the face through internet? Wouldn’t it be good if you could punch people in the face through internet? The Internet is an ideal platform for people who want to communicate their unique and ideas. However unfortunately, many people get quite nervous in online debates, sometimes even go outright crazy and abusive. On top of that, but there are also people who get some entertainment out of harassing others. Both of which leads to bullying – intentional or unintentional. Making cyberbullying all too real. One favorite technique used by cyberbullies is by undermining the online legitimacy of their targets. As an example, hostile commenters demand muteness by saying things like ‘shut up’, ‘does your mama know youre online’, ‘idiot, ‘moron’, ‘retard’. Or, attack the person’s knowledge, background, education, race, ethnicity, religion or even gender. These tell the speaker implicitly or explicitly that they should shut up, and they don’t have authority to talk on that topic or in that thread. They also may tell others not to engage with targets, no matter what they say. Unfortunately, similar responses could be repeated by others if they haven’t read the original articles or target’s posts thoroughly. So, what should we do to counter Cyberbullying? Be responsible and insist on providing good quality conversation: When we are being targeted by cyberbullies, it could be impossible to prevent our Facebook posts or blogs from being polluted by harsh comments. However, returning their insults would degrade our own conversation. In this case, we should think first, before typing. Stay focused on topic. If someone calls you names, attacks your personality, your credibility, your knowledge, do NOT reply to such remarks. This type of harassment is called Ad Hominem attacks. Instead prefer to stay on topic, and ask his/her arguments regarding the topic at hand, and his arguments/rebuttal against your argument. If they insist, tell them that personal attacks do not make an argument. If they do not start talking rationally, tell them that such discussion with personal attacks instead of arguments is unproductive, and you are bailing out of discussing with them. If you feel you need to get out of talking with someone due to abusive behavior, just politely tell that they are resorting to harassment and abusive behavior rather than talking with arguments, and therefore you will not be responding to them. Wish them a nice day, and stop replying to them. This is one of the most effective methods. Talk with references. Referenced comments are very hard to devalue or abuse. It doesn’t take a few seconds to go to google and search a reference for what you are talking on. Try to pick references which are from respectable sources. Ask for references. If a person is insistingly repeating a viewpoint in an abusive manner, ask them to rationalize their viewpoint or provide reliable references for the viewpoint. This stops a lot of bullies in their tracks. Remember the human nature behind those comments: Cruel words could bleed our heart, but those cyberbullies may be doing this only for fun. They may seek pleasure rush by intimidating others. If they see they succeed, they will push even more. If they can’t get anything out of you, they will lose interest. Take pity on cyberbullies: Bullies, both in real and online worlds, are usually people with unfulfilled lives. They divert frustration by unleashing uncivil comments on anonymous people online. There are cases when online trolls are tracked down and they are forced to make public apologies. In this case, it has been proven again and again that cyberbullies are just ordinary people who need to take their frustrations out. They do this without consider the harm they may do to themselves or others. Some of these people turn out to be middle-aged individuals, such as Brenda Leyland; who committed suicide after her identity is revealed. Remember to always stay logical, on-point, on-topic in a discussion. You are discussing viewpoints – not your id-egos or identities. Do not get attached to any viewpoint or concept and identify your own self with it. If the environment in a particular discussion avenue (Forum, Social Network Page, Group) is too polluted, consider leaving that place for a more decent environment. There is no point to discussing in a place where discussions are not productive in bringing different viewpoints to light and extending people’s horizons.